The recent rise in global prices of fuel has affected the operational costs of public transport operators. At the same time, the economy is recovering from the global recession. 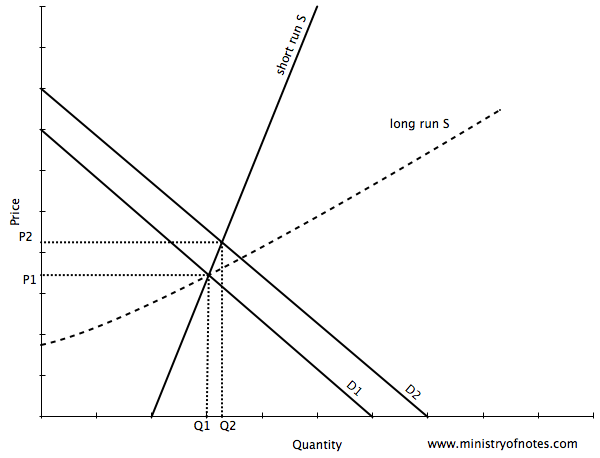 The equilibrium price and quantity in a market is only reached when demand for a good or service is equal to the supply. supply The public transport market consists of the market for bus and train transportation. When the price of fuel rises, it raises transport operator's cost of production. It is likely that one the main components of transport operators' cost are fuel expenses, the other being wages. A higher cost of production will shift the supply curve left. demand On the demand side, global recovery from the recession may lead to higher wages and household spending, including on public transport. demand income elasticity As incomes rise, the demand for public transport rises as it is a normal good. However, as public transport is a necessity, demand for it is income inelastic, and higher incomes would only lead to a less than proportionate increase in the quantity demanded for it. In reality, transport operators are regulated by the LTA and PTC, and cannot raise prices without permission nor remove non-profitable bus services. Without the ability to raise prices sufficiently, and faced with rising costs and increasing demand, they might reduce costs in other ways, such as reducing expenditures on maintaining service standards. def The market for private transport consists mainly of the demand for private cars. demand The demand for private cars is likely to increase together with economic recovery leading to households earning higher incomes. demand income elasticity The demand of cars is income elastic as it is deemed a luxury good by most households. When incomes rise, the demand for cars will increase by more than proportionately. cross price elasticity However, rising prices of fuel is likely to dampen this increase in demand for cars. As cars require fuel to operate, individuals consume these two goods together. As they are complements, the rise in price of fuel would lead to a fall in the demand for cars, all things equal. It is likely that this effect would be significant for drivers who drive daily and less significant for those who use their cars only for weekends. supply elasticity The supply of cars might be inelastic in the short run, as car manufacturers cannot react very quickly to changing demand conditions even with efficient chain management. Supply would be more elastic in the long run. overall analysis It is hard to determine the final effect of these events on the demand for cars in the private transport market. Assuming a high rise in incomes due to the global recovery which outweighs the effect of the rise in fuel prices, demand increases slightly. The above analysis suggests that transportation prices, whether public or private, will tend to rise. As public and private transport are substitutes, househoulds will switch to either one when the other becomes relatively too expensive. As public transport is a public utility, the government should consider how it may keep the price of it affordable, especially for the lower income groups, who spend a larger proportion of their income on transportation.